Hidden behind the foothills that flank the Alaska Highway lies the interior of Kluane National Park, home to one of the world's largest non-polar icefields, Canada's highest peak (Mount Logan), and several immense valley glaciers. In summer 2010 my brother and I hiked the park's Slims West trail, a 64km (40 mile) backpack which culiminates in an epic vantage of the Kaskawulsh glacier from Observation Mountain. Although we didn't quite make the summit for the best views, this was still an incomparable hike through one of North America's truly wild landscapes. The video shows our 2010 trip. We hiked in to the Canada Creek campsite along the Slims West trail, from where we day hiked to the plateau on Observation Mountain. If you're planning the same trip, be aware that it probably won't look the same. Starting in 2016 the water from the Kaskawulsh glacier has been flowing largely into the Kaskawulsh River, rather than into the Slims River which features prominently in the video (as you can see, it was a mighty river!). If this change persists Observation Mountain will still be a world-class hiking destination, but the hike in will have quite a different feel. This is the route we took from the trailhead to the Canada Creek campsite along the Slims West trail (on days one and three), together with the day hike to the plateau on Observation Mountain (on day two). Click on the symbols for photos and short video clips depicting the hike. It is 32km from the trailhead to the top of Observation Mountain, the final destination for hikers tackling Kluane's Slims West trail. Many hikers, including us, try to complete the hike in 3 (long!) days, in which case the goal for Day 1 has to be to establish camp at Canada Creek, 22.5km (14 miles) up the valley. A good and fairly flat trail follows the west bank on the Slims River almost all of the way to the campground, so the hiking on Day 1 is fairly straightforward unless you have to detour downstream due to high water at Bullion Creek, or onto the hillside due to marshy conditions past the Bullion sand dunes. Before setting forth, you need to register at the small Sheep Mountain (Tachal Dhal) information center, where you can pick up loaner bear canisters for your food, and get information from the rangers on the water levels in the creeks. From the visitors' center, it's a short drive along a rocky road (readily passable in a regular car) to the trailhead proper. Early evening light on Kluane's Slims River, seen from the Slims River West trail not too far from the Canada Creek campground. 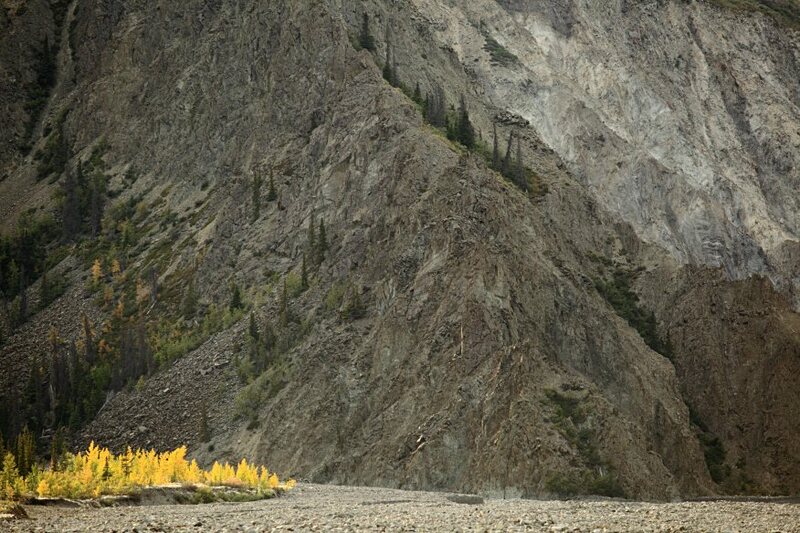 At least in 2010 this was an immense river, fed by meltwater from the Kaskawulsh glacier. Leaving the parking lot, the Slims West "trail", like several others in Kluane National Park, initially follows what remains of an old mining road along the valley. Rusting mining detritus adorns the trail, and it's easy and quick walking up to the first creek crossing at Sheep Creek. The word creek, as we soon discovered, is used inclusively in these parts, and can refer to anything from a burbling stream to a raging torrent! Sheep Creek, however, is a trifling obstacle, which we hopped over without so much as getting our feet wet. Once over Sheep Creek, the easy hiking continues past the turnoff for the Bullion Plateau trail, until reaching Bullion Creek at about the 6km mark. Crossing Bullion Creek is the crux of Day 1 of the hike - it's swift, fairly deep, and icy cold. Even when the creek is only about knee-deep, it's powerful enough that you can feel small pebbles rolling along the stream bed underfoot! Doing the hike during a dry spell in August, we were able to cross the creek, cautiously, at the point where the trail intersects it, but under higher water conditions you might well need to detour downstream to where the creek braids into multiple channels. Picking up the trail on the other side, there are no further obstacles and the route is obvious as far as the Bullion sand dunes, 9km in from the trailhead. We kept a careful lookout for bears (and made lots of noise) throughout this section - a mother and cub had apparently been hanging out here earlier in the season - but saw nothing except some paw prints. Beyond the sand dunes, Parks Canada's trail guide notes that there's a choice of route for the next 6km: either one can follow the river flats, or one can follow drier ground along the hillside at the edge of the valley. The ranger recommended the river route to us, and unless it's really obviously too wet to be passable this is sound advice. The trail along the river bank is boggy in places, but it's flat, direct, and easy to follow, while the trail across the hillside (which we took by mistake on the way out, since there's a spot where a small lake makes it seem that there's no riverside route) evidently sees little traffic and requires some bushwhacking. There are beautiful views along the Slims valley throughout this section. If you set off late, it's possible to find good camp sites here at the edge of the marshy meadows that adjoin the river. The final stretch of the Slims West trail starts at the 15km mark, when the trail reaches the first alluvial fan. From this point on, the river side route is no longer passable, even in dry conditions, so the trail, marked by large wooden posts and cairns, tracks inland and into the trees. There's some up and down to be negotiated here - but nothing that we found too strenuous - before one arrives at the Canada Creek campsite 22.5km from the trailhead. This is also the end of the official Slims River West trail - beyond the campsite there is a well-established route but no maintained trail toward Observation Mountain. The campsite at Canada Creek offers a jaw-dropping vista. 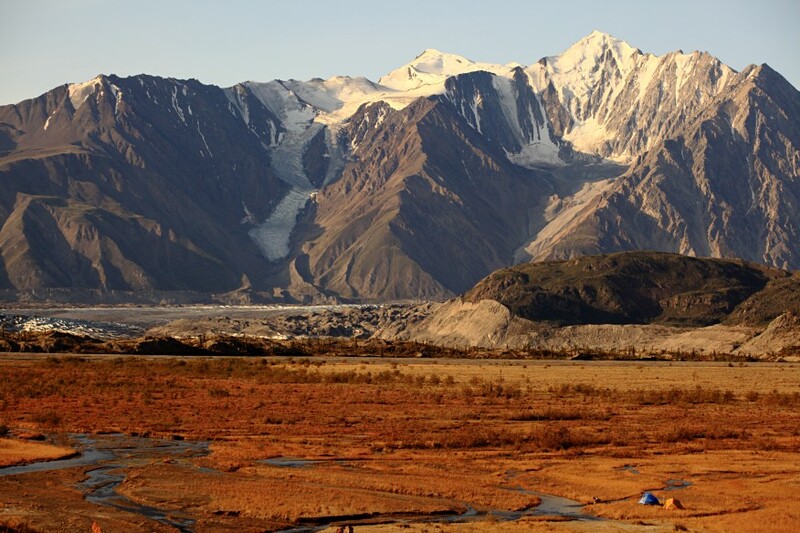 Beyond the barren flood plain of Canada Creek lies the toe of the Kaskawulsh glacier, and beyond that lies the impressive peak of 9,900 foot Mount Maxwell. The view from here is payoff enough for the hike in, even if you don't go any further. There's an outhouse and a fire pit (this is also where most folks stash their bear canisters overnight), but otherwise this is an undeveloped campground and you can pitch your tent wherever takes your fancy. We succumbed to the almost irresistable urge to setup camp on the grassy hill that overlooks the glacier, but it was a mistake - ferocious winds blew off the glacier during the second night and made sleeping difficult. Other, no doubt wiser and more experienced backpackers, forwent the views (which you can't see in the dark anyway!) and camped further back in the trees. Wherever you pitch your tent, though, be sure to keep the fly tightly closed at all times. The glacier is still busily grinding the bedrock into fine silt, and given half a chance will deposit what seems like pounds of the stuff inside one's tent! Water is available from the creek near the campground - it's not too silty but you probably do want to filter it even if you're using some other method to kill off nasty critters. The view from the small hill that overlooks the Canada Creek primitive campground. Observation Mountain is the dark hill to the right. The Kaskawulsh glacier flows down the valley in front of Mount Maxwell. From the campsite at Canada Creek it's 19km (12 miles) roundtrip, with 1200 meters (3,900 feet) of climbing, to the summit of Observation Mountain. That doesn't sound like a particularly strenuous day hike, but there's Canada Creek to cross (twice, with the second crossing likely be harder than the one on the way out, as the water level rises during the day) and no trail for most of that distance. The summer days are long at these high latitudes but still, don't underestimate the time required. Most of the parties we met found the hike to be harder and longer than they had anticipated. Canada Creek sprawls across the plain between the campsite and the glacier in literally dozens of channels, and the first order of business on Day 2 is to cross to the south side. If you're brave, experienced at crossing glacial creeks, and feeling lucky, the most direct route is to head from the campground on a bearing toward the summit of Observation Mountain. Being neither brave, experienced, or particularly lucky, we instead followed the Parks Canada advice and struck due south, on a bearing toward the toe of the Kaskawulsh glacier. This takes you away from where you really want to go - west up the Canada Creek drainage - but leads you across the middle of the plain where the creek has braided into numerous channels, none of which are too threatening to cross. I'd recommend taking this easy (but time consuming) route on the way out, though on the way back, once you have a better idea of the geography, it's possible to trade off the distance against the difficulty of the crossings and save some time (though don't think you'll cross Canada Creek in one go - coming out of the canyon it's a real cataract). Back on the right route, the trail up from the creek to the plateau is clear but short and steep. It's pretty easy to ascend, but there are lengthy stretches of loose footing that make for slow going on the way down. It's not dangerous, but this would be a really bad place to twist an ankle so care is needed, and a hiking pole comes in useful. Once up on the plateau the trail becomes obscure. A GPS comes in handy here to waypoint the spot, and ensure you don't start out down the wrong ridge on the descent. Since time was short after our ill-advised forays elsewhere on the mountain, we side-hilled our way across the plateau to the first point where there was a good view of the Kaskawulsh glacier. That was about a mile, and it would have taken another mile or so of hiking across the alpine to reach the edge of the plateau for the best views. Alternatively, of course, you can head straight to the summit of Observation Mountain. Regardless, the panorama is epic and astounding. Other options... We did the vanilla 3-day version of the hike, but if you have more time there are other possibilities worth exploring. Once across Canada Creek, it's tempting to continue hiking straight toward the toe of the glacier, which is partially hidden by a low rise. There's not enough time for a side trip like that if you're trying to summit Observation, but with an extra day you could bushwhack along the slopes between the glacier and the south-west side of Observation. One group we met was in fact planning to do just that instead of climbing the mountain. Another possibility would be to camp on the far side of Canada Creek, toward the confluence with Columbia Creek. Crossing Canada Creek can be the most time consuming part of the trip up the mountain, so a camp across the creek would allow more time to properly explore the vast plateau (and perhaps try climbing the peak that lies due west of Observation Mountain, from where the view is probably spectacular). This is an easy hiking trip to organize. No advance reservation is needed for the trail or for campsites, and although the trip is popular by Yukon standards, hikers are thin enough on the ground that the exceptionally helpful Parks Canada staff still seem genuinely pleased to see another. We flew into Whitehorse - the capital of the Yukon - on a direct flight from Calgary, rented a car, and drove to Haines Junction, which is the main base for exploring Kluane. From Haines Junction it's less than an hour's drive up the Alaska Highway to the Tachal Dhal (Sheep Mountain) Information Center, where the Slims West hike begins. Unless you run into a bear (we didn't), the most challenging aspect of the Slims West trail will be the multiple creek crossings. A hiking pole or wading staff is essential equipment, and canyoneering or water shoes - with neoprene socks - come in very handy. In a misguided attempt to save weight I left my canyoneering shoes at home and took only flip flops. I did save weight - and I didn't get swept away - but believe me it was cold and uncomfortable! Otherwise, normal backpacking gear is all you need. One thing to bear in mind is that the Slims West trail is sporadically closed when there are bears frequenting the trail. The closures are unpredictable and generally short - a week or so - but not infrequent, there were at least a couple in the summer of 2010. It's therefore worth having a plan B in case you're unlucky, and arrive to find the route out of bounds. One alternate option if you're set on a Kaskawulsh glacier hike is the Slims East trail, which also brings you to the face of the glacier but without an easy way to gain the panoramic vista afforded by Observation Mountain. You could also try a few days on the Cottonwood trail, further south in the park, or explore a host of remoter valleys where I doubt you'd see another soul. Parks Canada Kluane National Park page has basic information on the park, including a list of day hikes and possible backpacking routes (including some true epics). During the summer there are updates whenever there are trail closures (check under "Important Bulletins"). More photos from Kluane and the Yukon, courtesy of my brother.